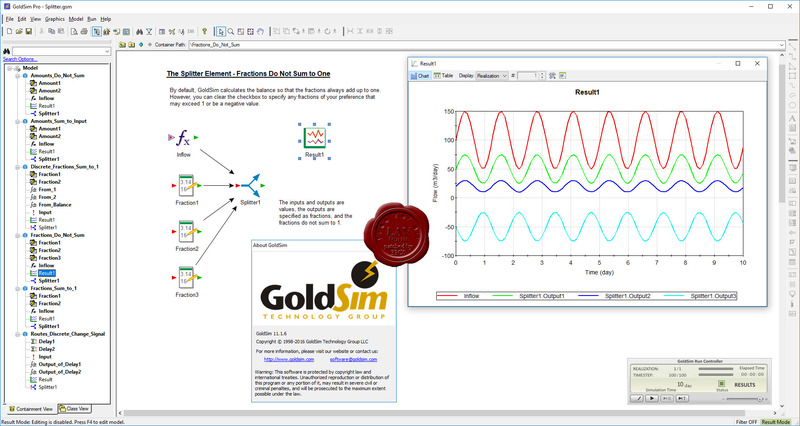 GoldSim is a powerful and flexible platform for visualizing and dynamically simulating complex systems in engineering, science and business. In a sense, GoldSim is like a "visual spreadsheet" that allows you to graphically create and manipulate data and equations. GoldSim moves beyond spreadsheets, however, by making it much easier for you to evaluate how systems evolve over time, and predict their future behavior. GoldSim has powerful probabilistic simulation features to quantitatively represent the inherent variability and uncertainty present in all real-world systems. This allows you to realistically evaluate how systems are likely to change and evolve over time in order to compare alternative designs, plans and policies, minimize risks and make better decisions in an uncertain world.